Stretched across an immaculate fifteen-acre tropical garden in Seminyak, the 74-room Oberoi Bali distinguished itself as the island’s first upmarket beach resort when it opened in 1978. This iconic Bali hotel has since been favoured by royalty, heads of state, and celebrities alike with its beginnings steeped in luxury hospitality having been purposely created to host an international jet set clientele. Initially built in 1972 as the exclusive Kayu Aya private club, the Oberoi was a multi-million dollar cluster of villas for the world’s wealthy and famous. Australian architect, Peter Muller oversaw the initial building of the Kaya Aya club on the site of an ancient village, and he also managed the later expansion of the hotel that would become the Bali Oberoi. In the forty years since it opened, the Oberoi Bali has deservedly earned its place among the few fabled hotels defined by the affluent and discerning travellers that frequent them. The Oberoi is centrally located in cosmopolitan Seminyak fronting Petitenget beach — which is considered by the Balinese to be one of the holiest on the western coast of Bali. The hotel’s acres of bucolic gardens give guests a peaceful respite from the hectic pace of Seminyak’s most vibrant area outside the hotel. Jalan Kayu Aya, best known as “Eat Street” is a step away from the Oberoi’s entrance, and Ku De Ta beach club is next door. The hotel is 12 kilometres north from Bali’s Ngurah Rai International Airport, a 30-minute drive by car. The resort has 74 rooms spaced across the fifteen-acre garden in two room categories that comprise of 14 villas — most have a private swimming pool and 60 Lanai rooms. 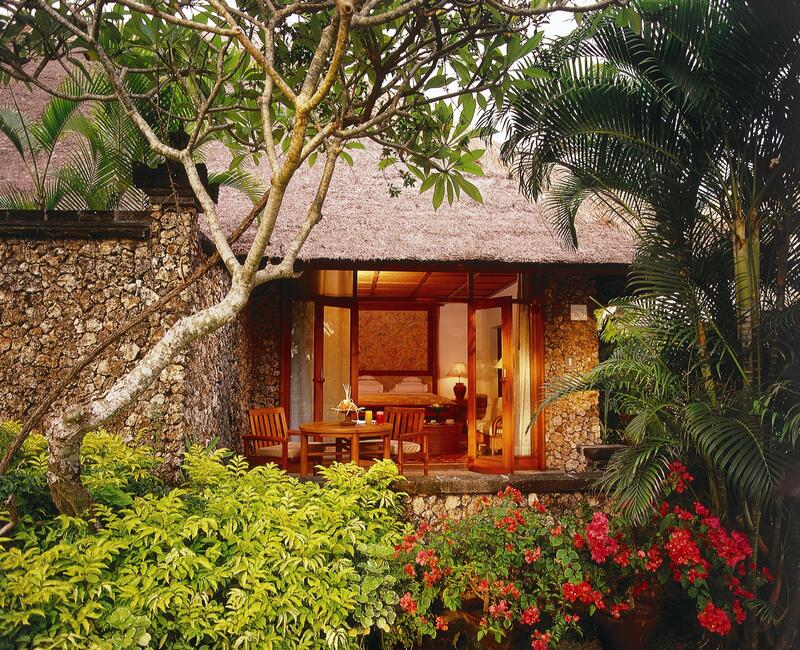 The rooms are all housed in stone pavilions under a traditionally thatched roof created by skilled Balinese artisans and feature air conditioning and floor-to-ceiling windows that flood the rooms with natural light. Under review was a 56sqm Lanai garden-view room with a king-size bed, comfortable living area upholstered natural fabrics, and a private terrace furnished for outdoor dining. The room featured Indonesian marble floors, a bathroom with double vanity sinks, a sunken marble bathtub, and separate shower that looked out on a small private garden. 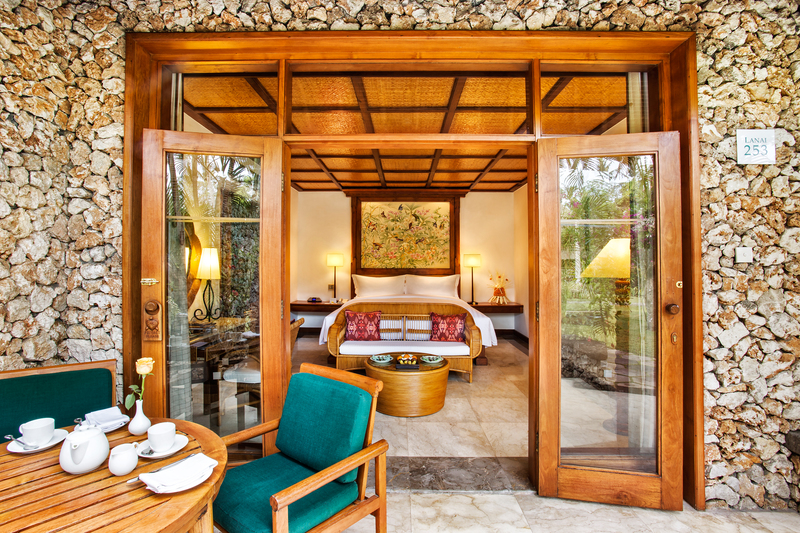 Bathrobes and slippers were supplied, as well as a full set of plant-based Oberoi toiletries and complimentary bottled water. The room was fitted out with modern conveniences including a sound docking station, LED television loaded with a wide range of international news and film channels and free high-speed Wi-Fi. The Oberoi offers two outstanding restaurants including the open air thatched pavilion restaurant Kura Kura, and the more casual seaside Frangipani Café for alfresco breakfasts and lunches. Guests should definitely begin their day at Frangipani Café for the multi-course, al-a-carte breakfast. The American breakfast option includes freshly squeezed fruit juice, a choice of cold cuts or bircher muesli, crispy streaky bacon, sausages, a selection of pastries, tea or coffee, and a hot dish from the a-la-carte menu — the huevos motuleños with two eggs sunny side up is highly recommended. The dinner-only Kura Kura restaurant serves gastronomic Balinese fare, incorporating the historical and cultural influences of European, Indian, and Indonesian cuisines. Stand out dishes include the Malabar Barramundi curry in spicy tomato and coconut sauce, deep fried jumbo tiger prawns with sweet and sour dip, and seared Pacific Diver scallops with foie gras, organic spring leek, green mango puree and confit spinach. 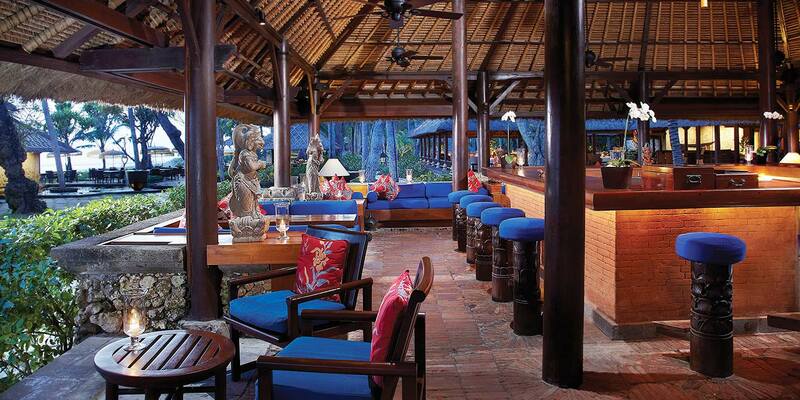 The Oberoi’s Kayu Bar is open daily to midnight offering a bar menu with light meals and serves champagne, fine wines and tropical cocktails — the lemongrass Passiontini and the strawberry basil caipiroska are dangerously addictive. The Oberoi’s five-star facilities include a seasonal turtle sanctuary, a stone amphitheatre for bi-weekly cultural performances featuring Gamelan music and classical Balinese dance, a 35-metre beachfront pool with uninterrupted views across the Indian Ocean, a flood-lit tennis court, and an air-conditioned gym fully equipped with cardiovascular and weights machines, as well as free weights. Guest can also request private aqua Pilates and beachfront yoga in the hotel gardens. The Oberoi Spa has two private treatment rooms housed in traditional, open-air pavilions, with views across private, tropical gardens and lily ponds. A variety of aromatherapy and Ayurveda treatments are offered such as hot herbal poultice therapy, Indian head massage, reflexology therapy, and facials using world-renowned spa brand Omorovicza. The hotel also has a seasonal turtle sanctuary between May and October, and guests are invited to play a role in the legacy of turtle conservation. The Oberoi is home to a saltwater turtle sanctuary when female sea turtles from the endangered Olive Ridley species come ashore at night to lay their eggs along the 500-metre-wide stretch of Seminyak beach in front of the hotel. The Oberoi, Bali safeguards the turtle eggs from predators by relocating the nests to a patch of sand within the hotel premises. After an incubation period of 45-50 days, the baby turtles begin to hatch. At ten to fourteen days old, the hotel invites their guests to participate in releasing the baby turtles to the sea. The Oberoi Bali exudes old-school elegance, class and sophistication with its secluded, idyllic location away from the tourist throng and tranquil atmosphere afforded by its fifteen-acre garden located in the heart of Seminyak. The high standard of personalised service will exceed the expectations of any well-heeled traveller. The Oberoi is an excellent option for couples and honeymooners wanting a romantic getaway and can depend on well-trained staff to organise experiences such as candle-lit dinners on the beach or in the privacy of their villa. Executives are another demographic well suited for the Oberoi Bali — whether is it a quick regenerating break from their hectic schedules or part of workplace incentive scheme to reward top-performing employees. AGENTS: It is time to cash in on the multi-trillion dollar wellness industry. Check out this latest offering from The Legian’s flagship property in Seminyak to find out how. This news has inspired us to impose a similar system in the Travel Weekly office. You’ll now need to bring us a box of cupcakes if you want to get through the door. Check your passports, folks, because it looks like Australia’s fave holiday destination is cracking down on damaged travel documents.